This Leica SF 24D Flash (Black), #208431, is in excellent condition (9 ). The flash is in. Includes box, manual, felt pouch and lens kit. Two new batteries were installed and tested. It's in working order. Also, the flash has a constant LED video light with 2 output settings and a maximum output of 30 lux at 3.3'. The SF 26 flash also features 1st and 2nd curtain synchronization options and can function as an automatic fill. 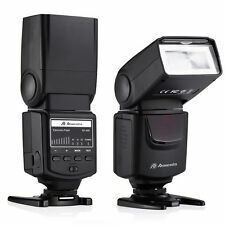 Also, the flash has a constant LED video light with 2 output settings and a maximum output of 30 lux at 3.3'. Leica SF 20 Flash for R & M Cameras - Guide No. 65' (20 m) at 35mm Not considered *mint* due to no box or instruction manual, but flash itself is as such The compact and lightweight LEICA SF20 allows TTL-flash exposure control with the LEICA R8 as well as the new LEICA M6 TTL-models plus automatic flash exposure control with all other LEICA M and R cameras with central X hot-shoe contact. All neccessary information such as film speed, aperture and distance is available in the LCD which can be illuminated on demand. Leica photographers` creative ambitions are satisfied by the option to utilize the flash exposure compensation feature. MFR # 14414 Check the hi-res photos of the actual item you will receive. You can find us on Google by searching Cameragraphics and Auburn AL. Included: just the flash as shown in the pictures. The flash is in perfect working condition. There is one thin scratch on the side of the flash. make Supersized seem small. Get images that. This Leica SF 20 Flash (14414), #111634, is in great condition with minor handling wear. We take pride in our used inventory, and we stand behind it. Warranty Info. The flash adapter is the SCA 3502. Data Sheet. Original Case. Insutruction Manual. It uses two (2) 3V batteries (not included). We take pride in our used inventory, and we stand behind it. Warranty Info. The Flash is in good shape, still very bright, there is no guide book included, no batteries included, box is in poor shape. I am offering a vintage flash gun that appears to have a military or country's insignia on it's reflector. It appears to spell Rayoram ???. This flash was used on film type cameras. It appears to be a circa 1930's / 1940's era unit. The battery compartment holds 2 D cell batteries and is 10"H. It is in my opinion in great condition for it's age. The battery compartment looks as though it was hardly used. 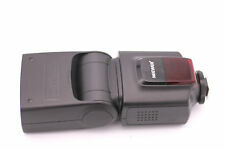 Sunpak Auto Zoom Thyristor 3600 Handle Camera Flash with Manual. Condition is Used. Shipped with USPS Priority Mail. Very clean and in working condition. This lot includes everything you see in the pictures. Money back guarantee if you don’t like it for any reason. Good luck! This flash is in excellent condition with little signs of wear. It has wear and marks. Functionally, this flash is in proper working order. This Leica SF 24D is ready to use! We take pride in our used inventory, and we stand behind it. Warranty Info. Very nice condition flash. Tested and works. This flash has seldom been used. Also includes small flash soft box and strobe stand. About the item: This item is associated with the following MPN(s): 3600. WE WILL BE HAPPY TO WORK OUT ANY PROBLEMS/ISSUES RELATING TO YOUR ORDER. You are looking at a Vivitar 2000 Electronic Flash. This item is in good, used condition. If you have any questions please ask seller. Shipping will be Free. You're purchasing a Leica SF SF 58 Shoe Mount Flash for Leica. Includes mini stand, soft case instruction manual and box. Flash is fully working. It is against the law. We CAN NOT mark your item as GIFT. 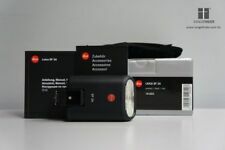 The Leitz Synchronblitzer is a bulb flash made by Leica. The flash has a fan-shaped reflector that opens up behind the flashbulb, but then retracts so the flash unit closes up into a compact shape that is about 2-1/4 x 4-1/4. The cable or "flashgun lead" is coiled and the head imbedded around a circular depression. Leica SF 58 Shoe Mount Flash #14488 for Leica NEW OPEN BOX Free Shipping!!!! 4.5 out of 5 stars - Leica SF 58 Shoe Mount Flash #14488 for Leica NEW OPEN BOX Free Shipping!!!! 6 product ratings6 product ratings - Leica SF 58 Shoe Mount Flash #14488 for Leica NEW OPEN BOX Free Shipping!!!! Works with Leica Q and Q2 in TTL. New in box. Includes both boxes. Illumination angle: 65°. •Array of 36 powerful LEDs provide bright, even lighting to range of 35 feet. • Adapter for Sony’s AIS shoe mount. Key Features. •Built-in diffuser provides even lighting, eliminates harsh shadows.